SCENE OF SLAVING, SMUGGLING, FILIBUSTERING AND FARMS. Very few areas of Texas can claim a longer time span of written history than can that thirty-mile sliver of sand known as Bolivar Peninsula. Even its very name is written in man's love of freedom for Simon Bolivar was the hero of the earliest filibusterers, Xavier Mina, James Long, and Warren D. C. Hall, to reside within its confines. But long before the first European ever visited there, it was also the gateway to Galveston Island for the East Texas Indian tribes, some of whom left its sands strewn with their arrow heads, pottery shards, and the bones of their dead. The first European visitor there was probably Cabeza de Vaca, who in November, 1528, was washed ashore on Galveston Island and who later traveled extensively on the mainland. In 1719, the Orcoquisa Indians captured Simars de Belle Isle, a French naval officer who had been accidentally marooned on Galveston Island. Perhaps the peninsula was also the scene of cannibalistic ritualism, for both of its stone-age tribes, the Orcoquisas and Karankawas, stand accused by Belle Isle as being practitioners of anthropophagy. However, many objective historians reject Belle Isle's accounts of cannibalism. Between 1816 and 1822, that coastal extremity, being one of a string of barrier reefs protecting the Texas Coast, became notorious as a base for filibuster activities against Spain, and hence, its name. At that moment, General Simon Bolivar was the leader of almost all the republican revolts against Spain then in progress in Central and South America, and the special hero of the American filibusterers of Texas who sought to free Mexico from the Spanish yoke. In 1816, two Spanish rebels, Gen. Xavier Mina and Don Luis de Aury, began using Galveston Island as a base of operations in their private war against Spain, and the ranks included many Anglo republicans from Louisiana. In that year, Mina sent 100 of his men under Colonel Warren D. C. Hall to occupy Bolivar Point. Hall erected a fort there, of log and sand embankments, where his small garrison remained for the next six months. After Mina's expedition abandoned the area, a second filibustering expedition, under General James Long, occupied Bolivar point in 1820, and once more, Hall was one of the leaders of that group. In February, 1821, when Long's forces departed for Goliad, he left his wife, Jane Long, his infant daughter Ann, and servant Kian at the fort under the protection of a few soldiers. As their supplies dwindled away and their position became increasingly untenable and indefensible against the local Indians or the Spanish, the small garrison deserted, leaving Jane and her charges to fend for themselves. While at Bolivar, Mrs. Long gave birth to a second daughter, reputedly the first child of Anglo origin to be born in Texas. Jane's 11-month vigil, awaiting her husband's return, survives as the outstanding act of feminine heroism in early-day Texas. During the epoch of filibustering and piracy, the peninsula became an instrument in the overland slave trade between Galveston and Louisiana. The memoirs of Mary Campbell tell of her and her husband's (Capt. Jim Campbell) arrival at Bolivar Point in their wagon, accompanied by a herd of swine and 300 cattle, in April, 1817. The Campbells had come from Crow's Ferry on the Sabine River to join Jean Lafitte's pirate commune, where they lived for the next four years. Beginning in 1818, Lafitte and the Bowie brothers often moved coffles of African slaves over that natural highway to the Sabine River, where the sugar planters of Louisiana came to buy slaves at $1 a pound. In turn, other residents of the notorious "Neutral Strip" of Louisiana traveled that same highway of sand in order to reach Galveston and join the ranks of the buccaneers. In fact, since Mary Campbell's first child was born on Galveston Island in 1818, there is ample room for doubt about Jane Long's child being the first Anglo child born in Texas. For the first fifteen years after 1822, Bolivar Peninsula probably reverted to a habitat for the herds of deer and the nomad Orcoquisa Indians. On August 5, 1838, the peninsula's first settler, Samuel D. Parr, claimed a league of land, beginning at its point on the bay and extending five miles to the east. He was later granted a patent to it by the Republic of Texas. In the same year, he sold the first 960 acres to Archibald Wynn and William Lawrence, who in 1839 surveyed the townsite of Ismail into lots and blocks and offered them for sale to the public. Altogether, the town at the tip of the peninsula has been known by four different names -- Ismail, Parrsville, Gabion, and Port Bolivar. For a time, the proprietors touted Ismail as the "future seaport of Texas," but as the years passed, the new townsite sprouted only prairie grasses to be treaded upon by the hooves of countless cattle herds, whereas the new seaport of Galveston quickly flourished. Under the Texas Republic, the site of Rollover, where the peninsula is only about 600 yards wide, won notoriety as the "rolling over place" for smugglers. In 1843, Texas tariffs were so high that goods smuggled across the Sabine River could be sold at cheaper prices in such places as Crockett and Palestine than could legal wares imported through the port of Galveston. Hence, smugglers rolled their barrels of wares and freight across the peninsula at Rollover and later reloaded them in East Bay. During the 1840s, only a handful of farmers had settled at Bolivar. In September, 1847, three of them discovered a unique way to supplement their meager incomes when a 70-foot sperm whale washed up on the beach, 10 miles east of the point. The is the first historical account of a whale along the Texas coast, and according to the Galveston "Civilian," none of the sailors then in port had ever seen a whale previously in the Gulf of Mexico. In a week's time, the three farmers had extracted 200 barrels of whale oil from the blubber, as well as 25 barrels of sperm oil. The value of the whale oil would have been about equal to two years' cotton crops for each farmer. By 1850, fifteen families, half of them English immigrants, lived along the thirty mile stretch of land between High island and Bolivar Point. The earliest settlers included Martin Dunman of High Island, S. D. Parr, John G. Simpton, J. H. Fredenberg, William Reeves, William Allen, Solomon Bryan, Joseph Atkins, William Dorsett, William Holbrook, Thomas Bostick, and J. B. Benjamin. The census indicates that most of them were subsistence sodbusters, for only two of them, Parr and Dunman, owned a total of five slaves. On March 2, 1836, Joseph Dunman had carried a copy of William Barret Travis' last plea from the Alamo from Harrisburg to Liberty. Also during the 1830s, Capt. Simpton had been master of the Republic of Texas revenue cutter "Santa Anna," which cruised regularly in Sabine Lake and Galveston Bay. During the Civil War, the peninsula was patrolled eastward to High island by Confederate cavalrymen, because the Union blockade fleet offshore often sent raiding parties ashore to slaughter cattle. During the four years of war, a number of blockade-runners ran aground on the beaches while being pursued by Union gunboats. On one occasion, a Confederate schooner ran aground and was burned at High island after jettisoning 200 kegs of gunpowder in an futile attempt to outsail its pursuer. During the three decades prior to 1880, many new settlers came to the coastal extremity to live until, by 1885, the population had increased to eighty families, numbering nearly 500 persons. Some of the later arrivals included A. J. Johnson, C. W. Kahla, John Crainer, Frank Crainer, Willie Patton, John Strathan, James A. Crenshaw, Vincent Linder, Jacob Hampshire, R. C. Nuckles, Fred Schneider, R. H. Slaughter, Oscar Flake, F. M. Roberson, George Simpton, W. H. Dailey, and five Shaw families. For a few years after 1865, the Bolivar farmers turned to sea island cotton as their principal cash crop. At its peak, the silky staple brought as much as $1.10 a pound on the English market, where it was interwoven with the product of the silk worm, after which the finished cloth was exported to America as "Pure Silk." When that commodity dropped extensively in price, the peninsula pioneers began growing produce for the Galveston and Houston markets, and by 1880, Bolivar had already become the watermelon capital of Texas. In 1881 the farmers began shipping melons by box car from Galveston, and in 1883, 137 cars, totaling 205,000 watermelons went to northern markets, increasing annually for many decades thereafter. In time, about 1,000 Bolivar acres were fenced off from the cow pastures for watermelon culture, with similar acreage devoted to tomatoes, cantaloupes, and other produce. Bolivar's supremacy as the watermelon capital lasted until the middle 1930s. By 1885, Bolivar Peninsula was also commanding attention as a livestock region, with its single cross fence at Rollover dividing the peninsula into two cow pastures. In the west, or "18-mile," pasture, 10,000 heads of cattle and 2,000 sheep, belonging to the Johnson, Nuckles, Kahla, and Atkins families grazed. The east pasture, to a point beyond High island, belonged to C. T. Cade and Co. of Iberville Parish, Louisiana, and contained 12,000 steers. Until 1880, Cade regularly moved large trail herds of cattle from High island to Louisiana, crossing the Neches River with them at Beaumont. 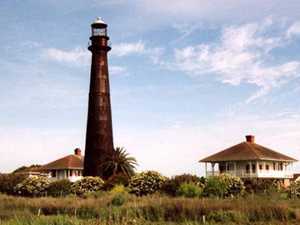 In 1872, Port Bolivar acquired its most familiar landmark when the lighthouse was completed. And for the next eighty years, its well-known beacon guided thousands of mariners into port in Galveston Bay. 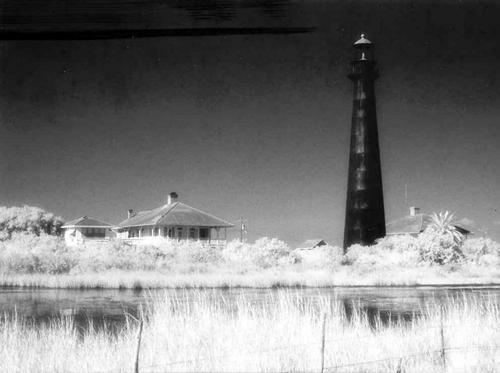 In 1952, when better navigational aids were available and its old beacon was obsolete, the Bolivar lighthouse became only one of many Gulf Coast light facilities whose beacons were extinguished for all time. After the Civil War, the protruding salt dome of High island also acquired a few settlers, who promptly covered much of its square-mile surface with flourishing peach and plum orchards. On the farm of George E. Smith, there were two or three ice-cold springs, whose tart waters tasted of iron and sulphur. And if a nearby hole were bored only a few feet deep, a strong flow of methane gas rushed forth, which burned with a bluish flame if ignited. Some predicted that, at some future date, the town would become one of the great mineral water spas (or "watering places" as such spas were then popularly called) of Texas. In time, High island did acquire some fame, but not as a health resort for the infirm. It was its oil field, Seaview Hotel, and its offshore bathing facilities and fishing which attracted tourists. After the building of the Gulf and Interstate line in 1896, High island became a favorite winter playground for the affluent lumber families of Beaumont. In 1885, Bolivar also produced one-half of all the oysters consumed by the Texas market. A fifteen-mile oyster reef, from Parr's Grove to Marsh Point, extended along the south shore of East Bay, and during the slack months of the planting season, many farm families supplemented their livelihoods by raking and shucking oysters from the reef. The event which gave Port Bolivar its greatest commercial promise came in 1894 when the Galveston and Interstate Railroad to Beaumont was chartered. Headed by L. P. Featherstone and Fox Winnie, the new rail line became a reality in November, 1896, after Beaumonters pledged $35,000 to finance a depot and the necessary right-of-way within that city. Featherstone had great plans for development of the port of Bolivar into a great shipping center. But only four years after the line's completion, a massive hurricane struck the central Texas coast on September 8, 1900, totally destroying Galveston and killing 6,000 persons there. Fortunately, 125 persons at Bolivar had sought refuge in the light house, and all of them were saved. But the volume of death and destruction everywhere on the peninsula was nonetheless staggering. Almost every home was destroyed or washed away. Forty-one persons, mostly from Crenshaw's, Patton, and Rollover, had drowned, including three entire families, those of William Strathan, Charles Atkins, and Franz Vincent. Over three hundred bodies floated up on the beaches, water supplies were contaminated, and the rapid putrefaction of hundreds of dead cattle forced the human survivors to abandon the peninsula immediately. Damage was also severe at Fort Travis, a coast artillery post near the lighthouse which had been built at Bolivar Point as part of the Fort Crockett coastal defense reservation during the Spanish-American War. In dollar values apart from human life, the greatest loss had been sustained by the railroad. The forty miles of trackage to High island were totally destroyed, and depots and rolling stock were washed away. And a passenger train which had just arrived at Bolivar from Beaumont before the storm was inundated by a mountain of sand. When the trackage was rebuilt and the locomotive and cars returned to Beaumont in 1904, they were publicized as the "train which ran three and one-half years behind schedule." For a time the railroad's directors considered abandoning the line, but like the nucleus of nestors who returned to rebuild their homes, they too finally gave in and began seeking the financing needed to rebuild. Bolivar's recovery was painfully slow, and five years transpired before the peninsula regained its pre-hurricane status. During that period of years, the Army's Corps of Engineers spent about $1,000,000 to rebuild Fort Travis, provided needed seawall protection, and deep channelization to Port Bolivar. Perhaps it was Col. Featherstone who contributed the most to the peninsula's recovery, for he continued his dream to build a great lumber and iron ore export terminal. 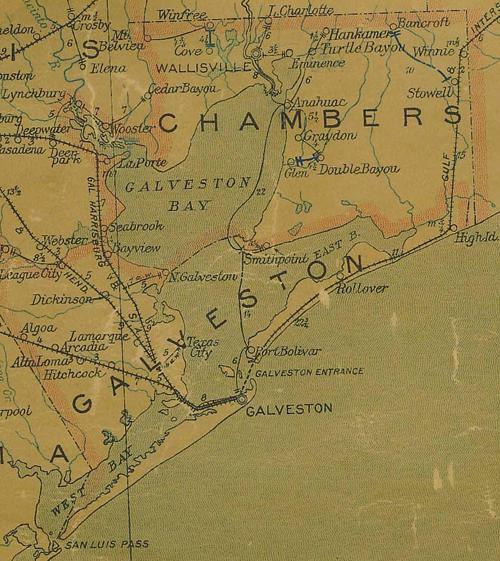 The Galveston and Interstate line soon became a part of the Sante Fe rail system, and its eventual link-up with the Gulf, Beaumont and Kansas City Railroad constituted a continuous line extending to Longview, Texas. The Port Bolivar Iron Ore Railroad, to connect Longview with the ferrous mines at Ore City, Texas, was then in the planning stages. Featherstone soon organized and headed the Port Bolivar City Company and helped organize the Sante Fe Dock and Channel Company, which in 1908 spent a half-million dollars to build piers, rail sidings, and warehouses. On June 9, 1909, the first deep-sea vessel, the "Margaret M. Ford," docked at Bolivar to unload granite for the seawall. And two weeks later, an English steamer, the "Penrith Castle," arrived and loaded aboard the port's first lumber shipment. In 1912, the ore dock there was completed. And lumber shipments quickly mushroomed, increasing to 15,000,000 feet in 1911 and 23.8 million feet in 1912. For a few years, especially during World War I, the new port of Bolivar prospered, but soon after, a number of items would account for its eventual demise. Completion of the Houston Ship Channel diverted much of its traffic, and the demand for East Texas iron ore, a greatly inferior grade, quickly plummeted. Eventually, the deep channelization of the Sabine and Neches Rivers to Beaumont and Orange would end the lumber trade to Bolivar as well. Rather than another great hurricane, it was the receding financial tides, the throes of the Great Depression, which would sound the eventual death knell of Port Bolivar. Passenger train service from Beaumont to Bolivar was soon suspended, and a few years later, about 1932, the thirty miles of peninsula rail trackage beyond High island was abandoned entirely. But unwittingly, the Gulf and Interstate Railroad had already shaped Bolivar Peninsula's future. With the building of the Sea View Hotel, High Island, Rollover, Crystal Beach, and other peninsular resorts quickly became the year-round playground for the families of both Beaumont and Galveston, not to mention more distant points. And the passage of time has altered that seashore panorama but slightly. Despite the continuing threat of high winds and high tides during the hurricane season, the popularity of sea bathing, boating, beach cabins, bay fishing, or just a place to lay on the beach and soak up some sun, combine to guarantee the peninsula's continuance as a tourist mecca for decades to come. Reprinted from Beaumont ENTERPRISE, February 5, 1984, p. 1cc. Sources: Principally from "On Bolivar Peninsula," Galveston DAILY NEWS, July 25, 1886; various census lists; and other DAILY NEWS articles between 1895 and 1912. The first known Galveston Bay freeze came during the winter of 1821, when Jane Long, the wife of then-absent filibusterer Dr. James Long, was alone on Bolivar Peninsula with her five-year-old daughter and a slave girl. Oh, and Mrs. Long was just about to have her second baby. "Train #1 of the Gulf & Interstate Railroad, which left Beaumont, Texas, at 7:00 AM on September 8, 1900, to make the run to Port Bolivar, about 85 miles away by modern highway, arrived at Port Bolivar at 11:10 AM, September 24, 1903�three years, sixteen days, and ten minutes late. Some of the original passengers were still aboard..."